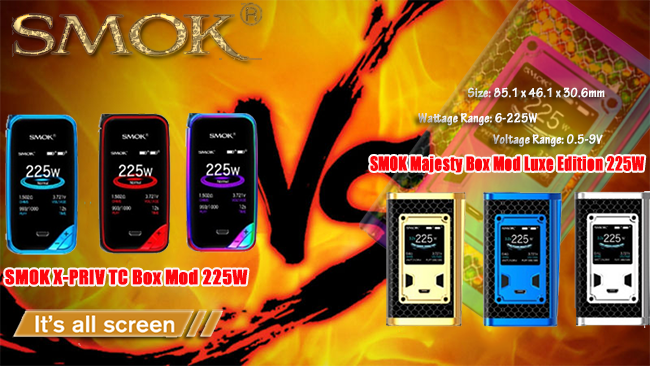 Smok X-PRIV Mod VS Majesty Luxe Mod, Which Wins? Morning Sunshine has come, how about your country? These two mods are the latest presents of SMOK factory, and as your part, which one do you like better, could you please give me your reason. 1,SMOK X-Priv Mod has a deluxe appearance and a high-definition screen with glassy material. It has a well-designed UI which is more simple and intuitive than other products. What's more, its output power can up to 225W which can meet different demands of vapor chasers. Feature: It is all screen! 2,SMOK Majesty Mod Luxe,an amazing kit deserving the name of masterpiece. It has ritzy, glossy appearance, every detail of the mod is telling you what exquisite means. It can reach a maximum output of 225W, with which you can enjoy massive vapor; and it has high-definition user interface, which can offer you comprehensive vaping data. You can get it just for $53.99. Please choose the one you like better from two! Thank you so much.